The UK speaker of the House of Commons said on Monday there will not be a third vote on Prime Minister Theresa May's Brexit deal in its current form. John Bercow said he could not allow the government to vote on a deal that is the "same proposition or substantially the same proposition as that of last week which was rejected by 149 votes". In order for a third vote, Bercow said that May must present a "demonstrable change" to her Brexit deal. 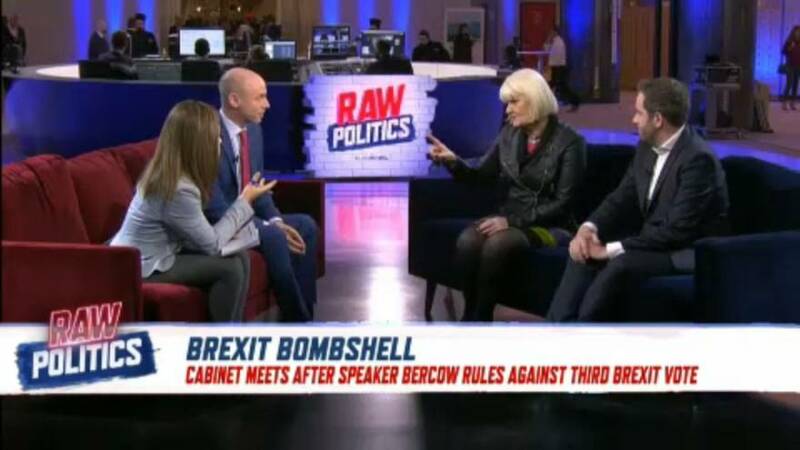 "There are very many different versions of Brexit," Irish MEP Marian Harkin said on Tuesday during Raw Politics. "That seems to be the problem. There cannot be an agreement on a version of Brexit that the majority of people can back," she added. With 10 days until the UK is set to leave the European Union, the pressure is mounting on May to find a way to leave the EU. "It's easy to slide into saying that Britain is in crisis," said Daniel Hannan, a British MEP for the Conservative Party. "Britain as a whole isn't in crisis. We have the best unemployment figures we've ever had, the stock exchange is booming, exports are up, consumer confidence is up. There is a Westminster crisis caused by this absolute refusal to do what MPs promised to." May on Wednesday asked European Council President Donald Tusk for an extension until June 30 in order to pass a Brexit deal.